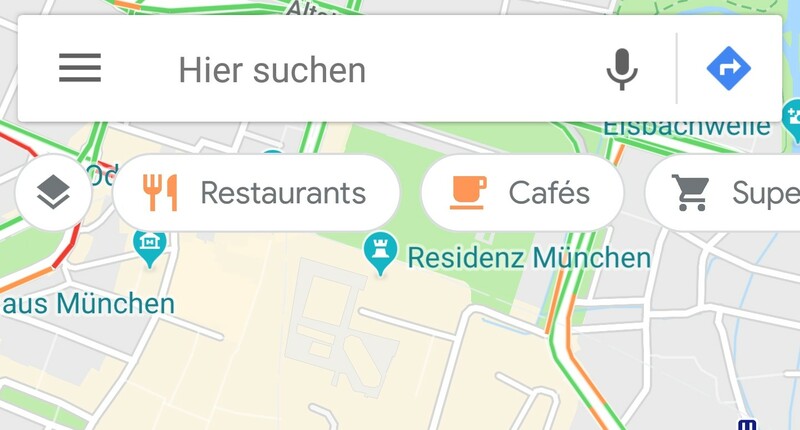 Google is always trying new things with the Maps app's interface, moving items from the side menu to the floating layers button, implementing different designs of the bottom bar in various regions, and lately just dabbling with more and more changes that fall in line with the new Material Design looks. And now we have a new change: a scrolling floating bar of category searches is showing up on the top of the screen. We've only received one tip of this, so maybe it's a limited test. Reader Max tells us that he's seeing this bar on the latest Google Maps beta, but I can't reproduce it on my devices. The Layers button is moved to the left of the screen and the floating category bubbles can be swiped through to reveal more. The bubbles also look very "Material Design 2.0," if you will, so they may be coming along with the updated Maps that will have all those Assistant and social features announced at I/O. Currently, six categories are showing up: restaurants, cafes, super markets, gas stations, pharmacies, and hospitals. (I can see the same when I tap the Explore button in the bottom bar on my devices, except hospitals is replaced by ATMs for me.) Tapping on any of the bubbles simply starts a search for it. So there's nothing new, functionality-wise. Max says the bubbles sometimes don't show up when the app is launched. However, the area where they're supposed to be isn't functional (you can't tap, move the map around, etc...). Once any landmark is tapped and he goes back, they appear. So this seems like a very early test still.